During yesterday match between chelsea and manchester united which ended 1-0 in favor of chelsea. United striker Radamel Falcao complained of a foul by Blues skipper John Terry in the build-up to the opening goal. Later on Hazard almost made it 2-0 but his close-range effort hit the bar after a surging run from Didier Drogba who made a shot that was deflected and hazard made a massive come back to hit the ball which at the end hit the bar. Manchester United midfielder, Ander Herrera was booked for simulation in the 95th minute after trying to win a penalty. 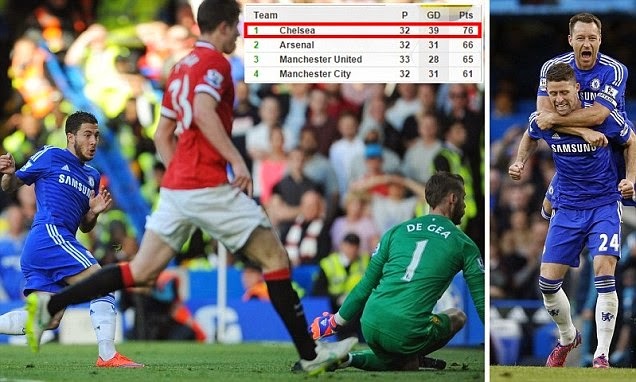 The final result means Jose Mourinho's side are now 10 points clear at the top of the table.